A great rendition of an iconic person. I won't say which side I'm on, but you've got to admit- his story is inspiring. Absolutely incredible. I am (and will be in 2012) a supporter of Barack Obama, but even if you aren't, this is not the place for outright rude and unjust political drama. Have some respect for the man that leads the country we all love. Hope!! Change!! Hopey changey hopey changey! *vomit* Gak. Change is somtimes for the worse. Change is movement. Movement causes friction. You did a fantastic job, but I extremly dislike Obama. You should of made it a portrait of sombody who actually acomplished something in life. Like one of the former presidents. I WAS AT THE 9/12 PROTEST AND I'M PROUD OF IT!!! P.S. Nice MOC. HEY! Comment below isnt very kind. Anyways, GREAT BUILD SEAN!! I LOVE THIS! OBAMA ROCKS! wow! can you please rate my creations and give me some constructive criticism, since you work at LEGO? nice job on ALL of your work! Yay Obama Won, there was so much news about it in Australia. Thanks for sorting out my problem! I was surpirsed you acted so quickly. i need your autograph.....also can u check out my creations please? omg so awsome!obama! obama! obama! Finally our country has some hope again! Very nice! 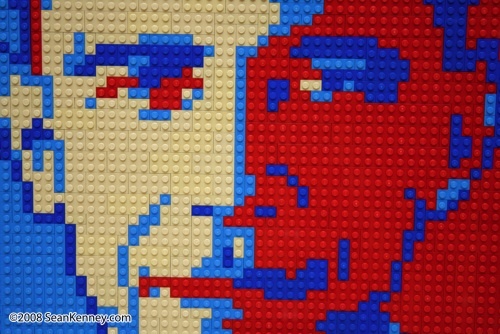 Even though my family didn't vote for Obama, this is still an awesome mosaic. Like the picture, not the man. I like it! Very good likeness! Not bad, interesting use of contrast. Subject could use improvement, though. Why not try someone more worthy like Washington? Awesome. That does look like that photo. the tan looks really good on it kind of like shading. the colors are all good too. nice jo even if i dnt like him. and Calloum Wood, your acting like Bush single-handedly ruined the world. he made good and not so good choices like everybody but you cant just pin everything on him. of well. another great MOC, Sean. callum wood, george w. bush has been one of the best presidents ever. he lowered taxes to best of his extent, and he gave us tax refunds. he kept his head when the terrorists attacked us, and we captured sadam hussein. how can you critisize bush???? ohh, this is supposed to be about the moc. very good style with the bricks. although i wanted mccain to win, i think obama will hopefully be a good president. WHY WHY WHY!!!!! Why did OBAMA have to win. Go Obama! His guy who swore him in, messed up his oath of office. Oh well, At least the world was peaceful under Biden's 7-minute presidency. But, hey, GO OBAMA!!!!! This is a very nice moc Sean. I like the coloring effect. If you have the time please check out my Sorry and Thanks moc. P.S. Thankyou so very much for not banning me though I deserved it. Callum: Bush had quite a few good moments, a few bad ones, and a whole lot of funny ones. Besides the fact that he increased Government spending and didn't protect our borders as well as he could, I thought he did a fairly good job, especially with protecting us from another terrorist attack. That said, you're absolutely right about Sean honoring Obama as our president, and how everyone should critique the MOC instead of the man being potrayed. And I'll add that this is an excellent piece of work, Sean. 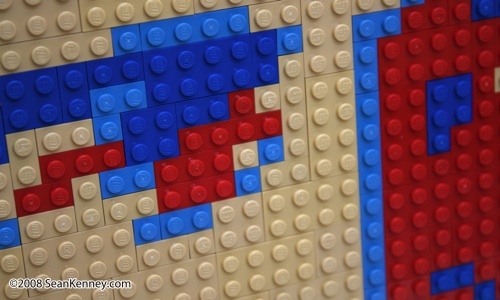 I'm in England but Obama's election has a huge effect on us too, but anyway back to the Lego... It's Awsome! Wow thats amazing! Brill, well done. I'm from Australia but what happens in the US has a big affect ,on what happens here.btw thats the best mosiac I have ever seen! Great work! I really like the colors you chose! About Barack, he's our president, we will respect him, and we will now pray for him to do whats right. I love it! Love the colors and no matter what your political beliefs are, he is the President. I would hate to go into a debate on this website. Yes, Yes, I know, I know, But, BOOOOO!!!!! The mosaic is great. However, the topic is horrible. Congratulations to Obama and the USA! Great creation that represents an historic moment. Awsome! It looks just like him! Even though he is not the person I voted for. He still looks cool. Ahh, an excellent work of art my friend. Looks just like him. Great work Sean! It's cool,but I was for John McCain. elite commando dave gray . This is really good & by the way Shepard Fairey was just on the Colbert Report, some really funny stuff! God guide him. We all know how much he needs it. Shepard Fairey owes you one! Even if you're not using HIS design. But still! Top work as always, Sean. The red, white and blue are a great touch, and you incorporated it very well. Quoting Andrew Becraft ndition of a classic poster. Great rendition of a classic poster. was i the first person to see this besides your family friends others??? Booo! I don't like Obama! But good job anyway!